This old girl is still working for a living over in the Netherlands. 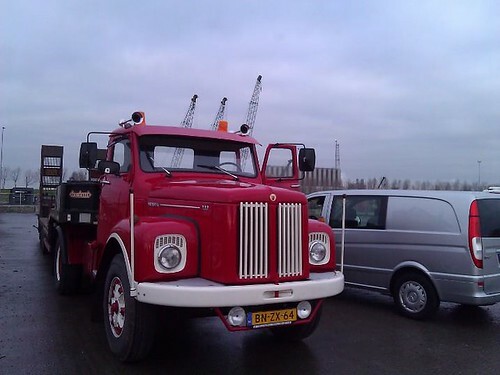 Spotted last week by HC Wilson driver Jon Pryke at Ritchie Brothers Auction site in Moerdijk. It looks to me like a bonnetted 110 (Scania that is! ), but you may want to correct me. The truck has been restored and has a lovely new looking interiour and a good paint job. 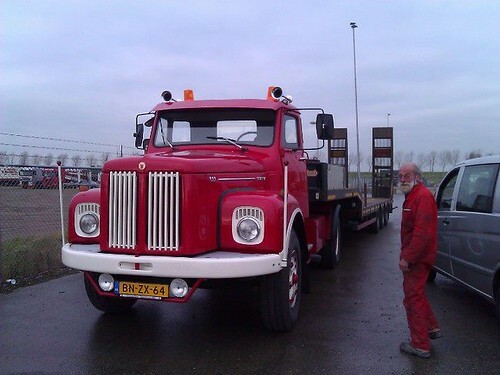 Pulling a 3 axle Nooteboom semi low loader, it was in Moerdijk loading some used plant. The old boy driving it, didn’t get why Jon wanted to click a couple of photos, as it’s just a working truck! Lovely to see these old trucks still out and about working, what ever country your in. Have you seen an oldie still doing a days graft? email me; ben@truckblog.co.uk or leave your comments below.